This week, I thought I'd repost one of my favorite desserts, Chocolate Chip Pound Cake. Mmm, I haven't made this in so long... I definitely have to make it again! Preheat the oven to 350 degrees. Spray a 9x5 loaf pan with cooking spray. Sift the flour, baking powder, and salt together into a medium bowl. Set aside. Place the butter and sugar in a large mixing bowl. Use a hand mixer on medium speed to mix the butter and sugar together. Add the eggs and vanilla and mix again until light and fluffy. Add the flour into the butter mixture a little at a time and mix with a wooden spoon. Continue to add the rest of the flour until all ingredients are moistened. Add the 2/3 cup chocolate chips and mix until well combined. Pour mixture into the loaf pan. Bake for 10 minutes. 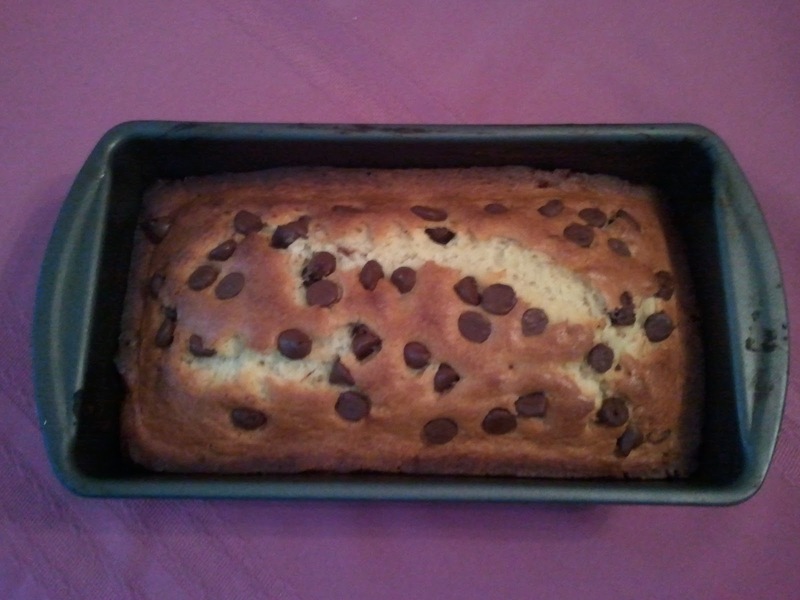 Remove pan from oven and sprinkle loaf with the remaining chocolate chips. Bake for another 20 minutes, then cover with aluminum foil. Bake for another 10-30 minutes, or until a skewer inserted in the cake comes out clean. Allow to cool for 15 minutes in the pan, then remove to a wire rack and allow cake to cool completely. Yummy! Love pound cake and love it even more w/chocolate!! Thanks for sharing at Foodtastic Friday! Thank you so much for sharing with Full Plate Thursday and a very Happy Holiday to you and your family.